External pump source supplies energy. This energy is absorbed by electrons in active medium. Population inversion is then created by the energised electrons. Photons then replicate in the active medium. Doped glass is used in active medium block. 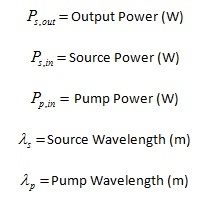 The pump wavelength is chosen to match absorption wavelength of doped glass. Light from pump and optical signal propagate simultaneously through the active medium. Erbium doped fiber amplifier (EDFA) is the most common optical amplifier in use. Those amplifiers are made from silica glass. EDFAs have 40 dB gains and 100 mW output power, low noise and low coupling loss. They operate in 1530 nm – 1560 nm wavelength band. An EDFA contains 5-30 m Er-doped silica fiber, pump light source 50 – 100 mW, two optical isolators and optical filter. Isolators are used to supress oscillations caused by amplification of reflected power. Amplified Spontaneous Emission (ASE) feedback is thus eliminated. The filter is used to supress ASE noise in gain bandwidth. Both forward, backward and bidirectional pumping configurations can be applied. - run out of pump photons (usually occurs at far end of fibre). In gain saturation region the system gain falls below maximum level. The gain of EDFA is not flat across the spectrum. Gain equalisation filters are used to flatten the system response. Noise in optical amplifiers is mostly caused by amplified spontaneous emission (ASE). Typical NF is 5 to 6 dB. Cumulated noise in cascaded systems reduces the signal level. Raman amplifiers use Stimulated Raman Scattering (SRS). SRS is a non-linear interaction between photons and high frequency molecular vibrations (phonons). Optical power is transferred from one wavelength to another wavelength by the energy of a phonon. Photons with smaller energy and longer wavelength stimulate the emission of cloned photons entering the fiber. A phonon is then excited by residual energy. Raman gain occurs when optical fiber is pumped at high power above 500 mW. - gain over a wide wavelength range. Multi-pump wavelengths and adjustment of pump powers is used. Distributed Raman Amplifiers (DRAs) amplify in transmission fiber. Discrete Raman Amplifiers pump power confined to short length of special fibre with enhanced Raman gain. Gain medium is dispersion compensating fiber.